A delightful collection of short stories by award winning author Anne K. Albert. 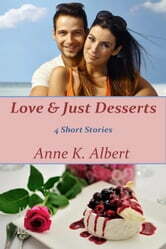 LOVE & JUST DESSERTS is perfect reading when time is in short supply! -Baker's Dozen, Katie's Gift, Botanic Justice, and The Green Flash. Also included are excerpts from novels Defending Glory and Frank, Incense, and Muriel.